When I recently bought a used X60s Thinkpad, to replace my even older x40, this also meant that I’ll need to replace my ~6 AC adapters that I have in all the locations where I could possibly want to charge my laptop. Buying 5 more adapters was not a solution as it would have been to expensive. At work we use Dell laptops, so I have access to as many AC adapters as I could possibly need. 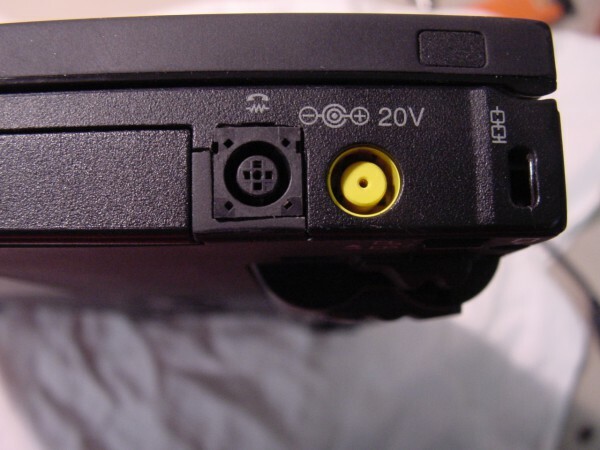 The Dell adapters are rated at 19.5V whereas the Lenovo adapters are 20.0V. That isn’t an issue, so it was looking good. The connector looked very similar, however it doesn’t fit. 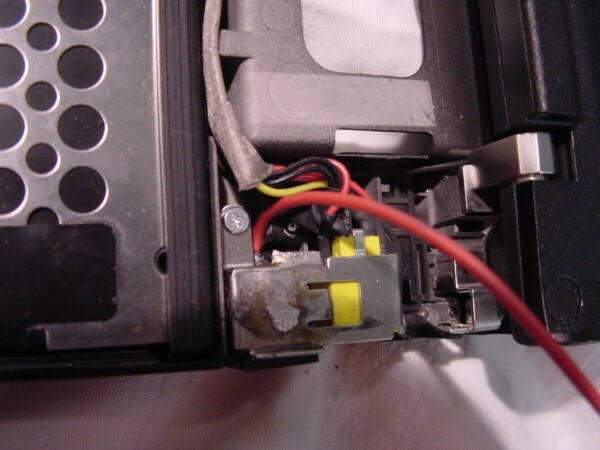 After removing the shield that holds down the DC jack + modem port, I’ve figured out, that there’s just about enough space to place the dell jack (out of a docking station) where the modem port used to be. 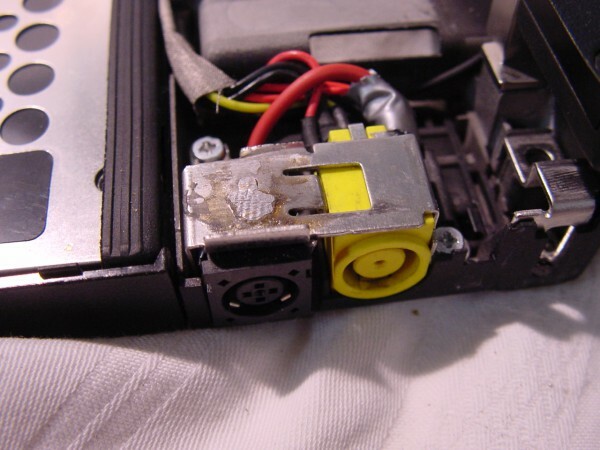 After some thinking, I’ve decided to drill two holes and solder the ground pins of the DC jack directly to the shield, this holds the whole jack in place, and also provides ground connectivity – one less cable. To connect the + I’ve added some copper wire which connects to the + terminal on the original Jack. 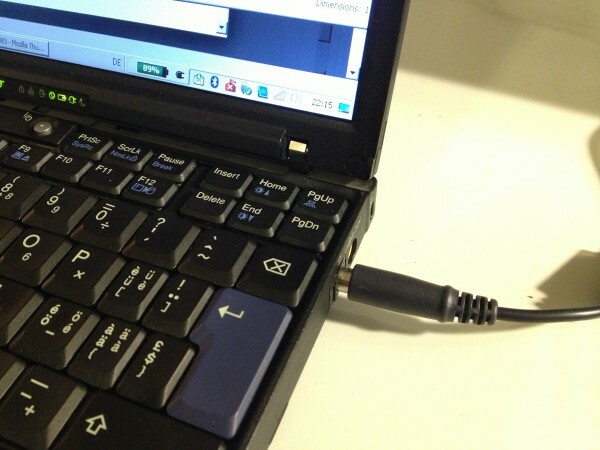 You should be aware, that the center pin isn’t the + connection but a data line, that lets your laptop communicate with the AC adapter. I don’t know anything about this protocol, but as I found out, it’s not necessary to connect this pin to the dell adapter (and it most likely isn’t the same protocol anyway). I’ve done a clean install of Windows XP with current drivers and utilitys on my Thinkpad X40. Strange thing was that presentation director didn’t show up when I push “FN-F7”, although all necessary packages were installed, and PD started fine through start menu. I then found out that PD 2.57, which is the most recent version published for the x40 seems to have problems with the actual version of Thinkpad Hotkey Drivers. Using Version 4.03 of PD, (found within the X60 drivers) works fine.